Understandably, professors on the tenure track are quite concerned about finding journals to publish in. The field of online learning presents many opportunities for those interested in adding to their CV’s. Given that online teaching and learning has been a dominant trend in higher education for over a decade, it is not surprising that a plethora of peer-reviewed journals have been created to document, research, and evaluate this mode of teaching. But online courses and programs are part of a much larger universe of interesting subjects including; new paradigms of teaching/learning; institutional change and resistance to change; disruptive technologies and their impact on the academy; strategic planning and envisioning a future “learning organization” (Senge); institutional policies and structures; alternative credentialing; and new ways to measure student learning. 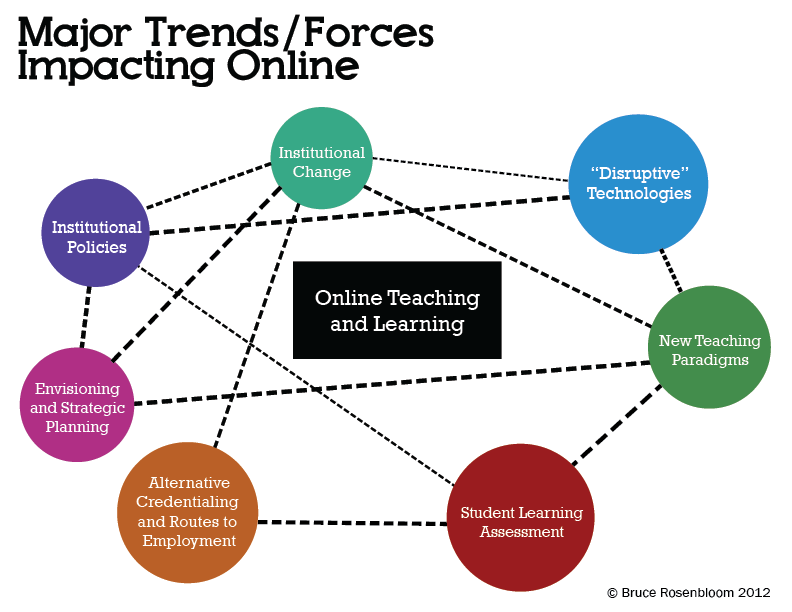 In many ways, online learning stands at a critical intersection of these trends. With the help of researcher Gina Medranda, I have assembled a list of peer-reviewed journals in this exploding field. With the right approach to a journal, many would offer a realistic opportunity to get published in this field. I will briefly offer some advice for novices to this field considering this possibility. Any academic research starts with a review of the literature. I would recommend reading several journals for the past few years and also consulting the academic press (Chronicle and Higher Ed News, NY Times for example) to give you a better sense as to what topics are in vogue, significant trends, distinguished online researchers/thinkers, and the current jargon / acronyms in this field. Part of this research would be contacting editors of these publications, going to major conferences (listed here), and speaking with a variety of people in the field. All of this might be warranted prior to “having an idea” for an article. Since the field of online teaching and learning is so broad, it may be useful to focus your efforts on a specific area like online assessment or student success online. Whatever area you choose, attempt to have a genuine interest in the subject, as a “labor of love” may carry you through numerous rejections of your queries and manuscripts. Another reason to focus your research is to be in a better position to select the most promising journals from the list of 20+ publications listed above (not an exhaustive list). If you are able to whittle down this list to a few promising journals, your next steps will be more achievable. This advice is not new to experienced academics. After closely reading the guidelines for submitting articles, you may still need to know what are the preferred topics an editor is seeking, recommended length and format, and other details that go beyond the standard description. Just as important, contact with the editor may start a rapport that can assist you in developing the article to be published, potentially with more articles to follow. If, however, the editor explicitly discourages such contact, it would be wise to honor that request. For research to have a wider impact, it may be useful to propose a collaboration between institutions, disciplines, or organizations. Increasingly, grantors require collaborative efforts to receive funding, The downside of this approach is obvious–there will be multiple contributors and therefore you may receive little credit for your efforts. I’m of the mindset that there is nothing like a good idea — maybe original, maybe standing on the shoulders of others in the field. A good idea needn’t be expensive to research and write up, nor be exorbitantly time-consuming or esoteric. Good ideas are the genesis of good papers and, personally, I wouldn’t proceed without it. I will give just two examples to illustrate my point. a. After tragic incidents at several institutions of higher learning, a few researchers came up with the idea of exploring emergency preparedness from the aspect of “academic continuity.” Their research was simply to explore college websites to determine if such a contingency was in their emergency planning. They discovered, in the vast majority of cases, no such provisions were in a college’s planning, and certainly not part of their website. At the conclusion of the article, recommendations were made to address this oversight (my blog post on their paper). b. In another study, researchers had online instructors keep a journal of their thoughts, insights, and impressions of teaching online courses over a three year period. These reflections became the basis of an important article about three major areas to address in terms of faculty development for new online professors (my blog post on their paper). The elegance and simplicity of a good research question carries tremendous momentum toward the eventual publication of an article. Undoubtedly, these and other factors will all contribute to improve your chances of seeing your paper in a respected journal. The arena of online teaching and learning, I believe, are ripe for discovering your next idea in print. Lin, H., Dyer, K., and Guo, Y. (2012). Exploring Online Teaching: A Three-Year Composite Journal of Concerns and Strategies from Online Instructors, Online Journal of Distance Learning Administrators, Vol. 15, Issue 3 (Fall 2012). Research Credit: Gina Medranda, CCNY Student Technologist, Center for Excellence in Teaching and Learning. Graphic Credit: Fulya Olgac, CCNY Student Technologist, Center for Excellence in Teaching and Learning. This entry was posted in Instructional Technology, Online Best Practices, Online Learning Policies, Procedures, Systems, Online Trends, Paradigm Shift. Bookmark the permalink.